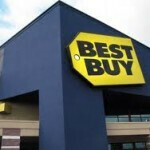 Back on June 1st, big box retailer Best Buy had the best day ever for its trade-in program when it offered a free 16GB Apple iPhone 5 to those trading in an Apple iPhone 4S or an Apple iPhone 4. Best Buy was so pleased by the results of the deal, that it is re-starting the trade-in program starting this Friday and running it for 9 days. The deal works like this. Bring in your working Apple iPhone 4 or Apple iPhone 4S and Best Buy will give you a credit of $150 toward an iPhone 5. The remaining $50 balance is taken care of thanks to a $50 price cut that the tech retailer has on the iPhone 5 until June 29th. And you must be eligible for an upgrade with your carrier. The deal is good only inside Best Buy or Best Buy Mobile stores. Perhaps this way you can make some impulse buys when you trade-in your older iPhone for the Apple iPhone 5. You'll need a new case, of course, and perhaps some other accessories that just happen to be hanging up right near the mobile department of the store. That's an absolutely awful promotion. Sounds like a rip off. You can get a lot of money for an iPhone 4S and some places like RadioShack sell the iPhone 5 $50 cheaper. Better to wait and sale the phone yourself when the iPhone 5s is released. Why buy a 9 month old phone now when so many good phones are on the market. You should be able to get $120 for the iPhone 4 and $200 for the iPhone 4s on Craigslist with no problems. 4s Is selling for $350-380 where I am. Where are you that they are that cheap? Dang it! My upgrade is on July 1st and was going to head over to Best Buy to get the iPhone 5 for $149, before learning that the offer is only until 6/29. Oh well, I guess I'll buy the refurbished version for the same price. THEY NEED TO MENTION THIS DEAL IS ONLY IF YOU BOUGHT THE iPHONE IN BEST BUY. READ THIS BEFORE WAISTING 2 HOURS IN LINE FOR NOTHING.